It’s a difficult choice to pick a target market and focus all your energy, resources and effort on one market. It’s a decision many small architects are afraid to make because we’re afraid of missing out on other opportunities and we don’t want to have all our eggs in one basket. When you pick a target market and become an expert on it, you’ll find that your next best client will find their way to you. Our guest this week has succeeded in making that decision and focusing on a target market early on in the development of his firm, and he’s thrived for over thirty years because of that. 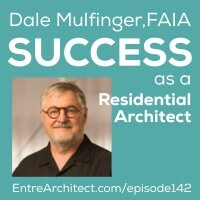 This week on EntreArchitect Podcast, Dale Mulfinger, FAIA of SALA Architects joins me and he shares his knowledge about How to Succeed as a Residential Architect. Dale grew up as a farm kid in rural Minnesota. After discovering his lack of desire to pursue farming, he excelled in a drafting program in high school. He succeeded in getting into the university and chose to study architecture. Through the help of amazing friends, many of whom are still friends now, he was able to complete his degree and graduate six years later. Early in Dale’s career he was focused on urban design, working on campus planning, large city developments, and more, but came to the realization that it takes a long time to be implemented. He began working for various architects, and found that as the projects got smaller, he enjoyed them more. Out of that came an understanding that he might really enjoy residential architecture. In 1983, he received an opportunity to design a house according to the ideas of Christopher Alexander’s book, A Pattern Language, and invited one of his graduate students, Sarah Susanka, to help him on the project. He wrote an article about that project and found a love of writing, which has stayed with him throughout his career. After being asked to design a cabin, with little knowledge he began his research and wrote articles about cabins for a local magazine. Seventy-two articles later, he began writing books on the process of building cabins. He noticed that nobody had really looked into cabins in depth, and worked to fill the void with architectural discussion around cabins. Cabins are rewarding to him because each cabin is uniquely different, because each person is so uniquely different. Many people build cabins as a legacy project, where they hope their children will seek to inherit for generations to come. SALA Architects began 30 years ago when Dale and Sarah realized that there wasn’t really anyone focused exclusively on residential architecture in their area. They hoped if they got the word out to the public about their interest in doing houses, that the public would be anxious for them to jump in. Because of that void, they grew rapidly. Yet, there are still unserved clients in their area who want to a create better home, whatever that may mean to them: more energy efficient, more beautiful, smaller or larger, etc. If you’re willing, as an architect, to help them do that, then they’re more than willing to pay for your service. When the decision came around to focus on residential architecture, their fear wasn’t how to grow the company, but how to serve their clients well. Because there’s a wealth of other talented architects serving other markets, Dale doesn’t feel as though he’s missed out by choosing to focus on a targeted area. SALA continues to do other projects outside of the typical scope. To get the word out about their business, they did two things: publishing and teaching. Dale and Sarah wrote articles for local publishers about remodels and additions and started courses for the public about residential architecture. They found ways to connect with the public and show them that they were proud of the work they were doing. Started a Home of the Month at the local newspaper // They suggested the idea to the editor and offered to help with the article and photography, and the newspaper jumped right on it. Adult education // There they were able to communicate theories and ideas. Instead of just sharing a project in a newspaper, you can introduce the public to innovative architecture ideas that they may not be familiar with. Because SALA is organized horizontally, each architect has their own clients, does their own designs, and complete their own projects with the support of the firm. They’ve learned that what keeps people in an office is camaraderie, that some people enjoy doing what they do in a group. At SALA, young professionals are nurtured and encouraged to go out and find their own ways to connect. When hiring, SALA looks for people who have a diverse set of talents and have a good sense of how to meet the public where they are. Dale’s biggest suggestion for struggling architects is to share the work that they are proud of with the local or national media around them, depending on the work they’re searching for. While many architects don’t consider themselves writers, architects have all learned to talk about their projects. Write from the basis of how you talk about your projects and get your ideas out there. Connect with Dale online at SALAarc.com, or on LinkedIn, Twitter, Facebook, and Instagram.